What do they have in common? Two are fantasy, two are space/s.f., one is historical, and two are party games. Four are pretty heavy, but Galaxy Trucker is mid-range, and, again, two are party games. No two have any major gameplay or mechanics in common. So, random list then? Guess again. They were all designed by one person: Vlaada Chvatil. He’s like the anti-Uwe Rosenberg. Although several of his games have spawned expansions or sequels, the sheer breadth of his design ideas is humbling. Every time a new game of his comes out I’m like: “This is nothing like anything he’s done before. How does he do it?” Whatever he turns his mind to just…works. Not to mention the way he weaves theme into most of his designs–even Codenames. I mean, could Space Alert really take place anywhere else but a ship hurtling through space, barely in control? Could Through the Ages be anything but a 4X Civ game? I mean, I’m sure he could design a pure abstract–and I’d be fascinated to see the results–but he doesn’t seem to be interested in those kind of games. The main beef most people have against Chvatil’s games–the heavier ones, mainly–are the rules. His preference is to split them into separate tutorial and reference booklets is great for learning the game but hell on toast when you’re trying to look up a specific rule. He should really take a leaf from FFG’s method here. They index their reference booklets alphabetically by topic with plenty of cross-referencing–for example, the Arkham Horror LCG. My first full three-player game of Mage Knight took ten hours, of which about two of which (no lie) were spent hunting down specific rules between the two booklets. Since then of course, the BGG community has put together some amazing reference aids for it. 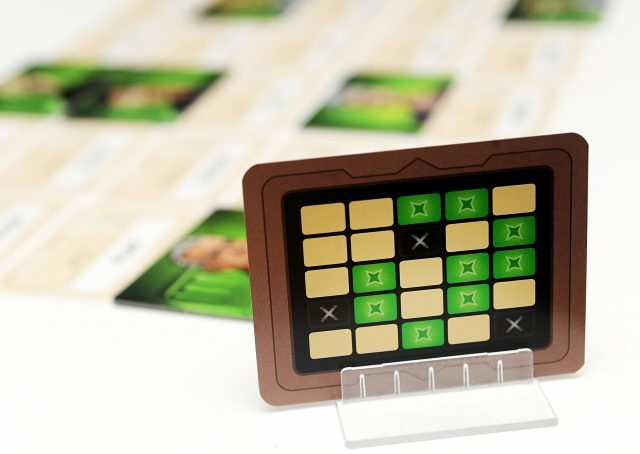 What made Codenames such a surprise was that it was such a departure from his meatier designs–although it seems that lately he seems to be spending more time on lighter fare. 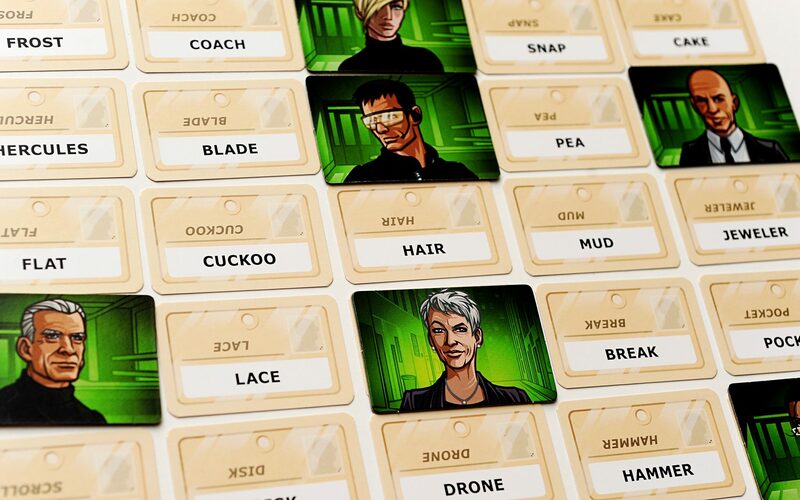 Codenames was a big hit out of the 2015 convention season, with the first print runs selling out really quickly. It has spawned four themed sets: Disney, Marvel, “After Dark” (ie, naughty), and Pictures. Amazingly for a party game, it sits at #34 on BGG’s all-time rankings. Unusually for Vlaada, he is not sole designer credited on the game, with Scot Eaton getting equal billing. 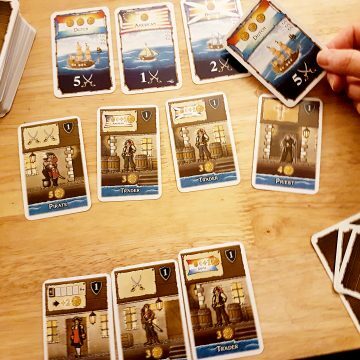 Until 2014 Eaton was an avid BGG contributor, designing unofficial mods for games like Catan and 7 Wonders. His first original game, Blend Off!, was released this year. I’m happy to say that, unlike Vlaada’s last co-design effort, Duet more than stands on its own; the less we speak of Star Trek: Frontiers, the better ((shudder)). Although the latest edition of Codenames has rules for two and three players, it’s really meant to be played with a minimum of four. Duet was designed specifically for two players, though it can be expanded into team play. Although it shares some superficial similarities with its predecessor, it’s cooperative, not competitive, and plays out somewhat differently. 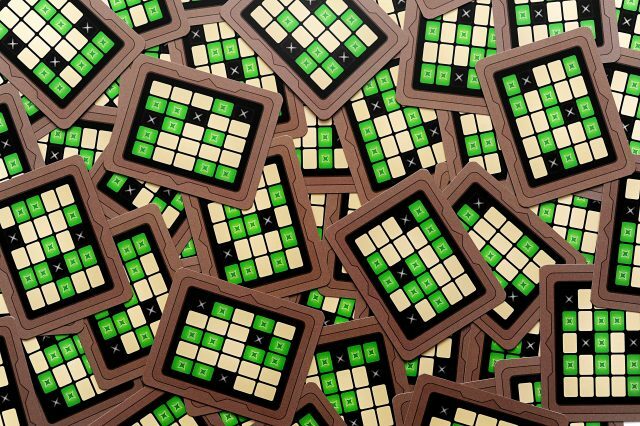 Players sit across from each other over the usual 5 x 5 grid of random nouns. This time round, the Key Card is two-sided, sitting in a stand between the players with each seeing only one side. 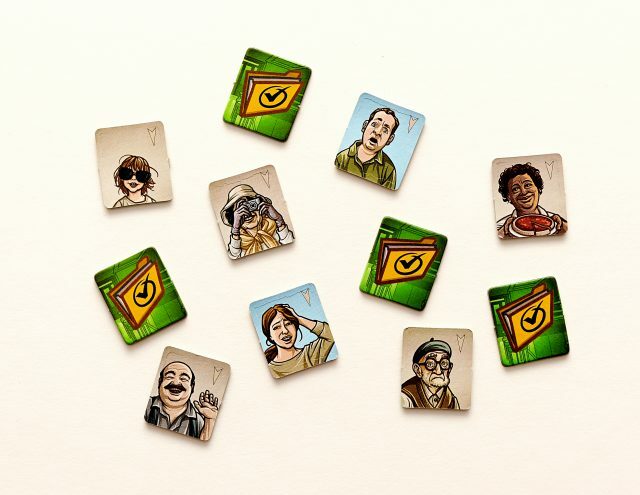 The Key Card grid is made up of nine Friendly agents (green), thirteen Bystanders (brown), and three Assassins (black). Three of the squares are Friendly on both sides. Of the Assassins, one is Friendly on the other side, one is a Bystander, and one is an Assassin. Therefore the players have different–but somewhat overlapping–starting information and goals. 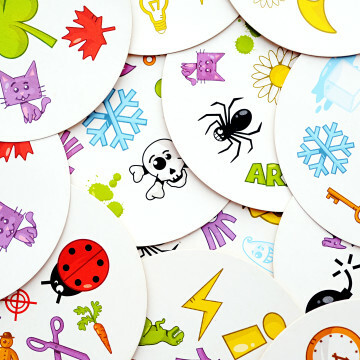 The object is to give clues back and forth until all the Friendlies have been identified. As before, a player who guesses successfully can keep going or quit while the going is good and end their turn. But you and your partner have only nine turns to identify all fifteen agents. And if you guess wrong (an “acceptable mistake” in game terminology), your turn is over–unless you guess a word which is an Assassin on your partner’s side, in which the game is over and you both lose. Duet simply screams “date night”. 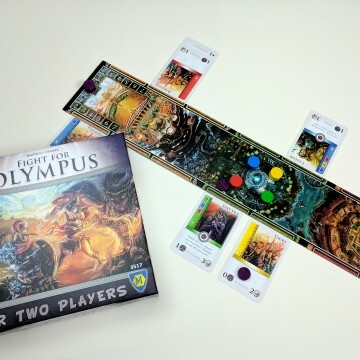 It rewards players who are in sync with each other, and the feeling of beating the game is then bathed in a “we’re meant for each other” glow which is so conducive for stepping away from the table and playing more dexterity-related games. Of course, the flipside is, like swing dancing, if you and your new Tinder buddy struggle with the game, it kinda puts a damper on the evening. But let’s think positive, people. On top of everything else, and completely unexpectedly, Duet includes a campaign mode of all things, where you keep track of your progress on a Mission Map marked with a network of cities around the world. 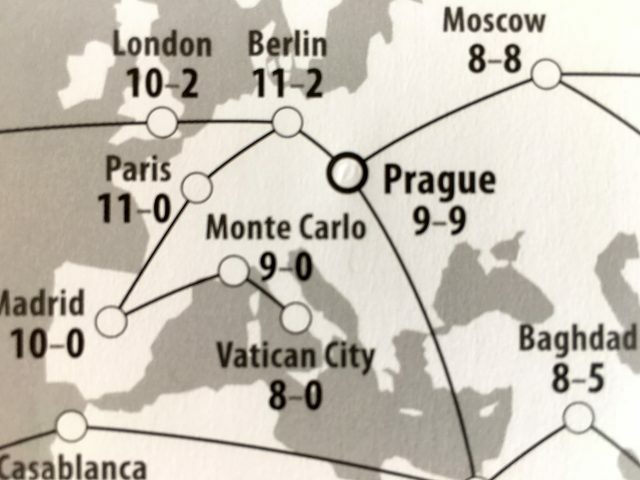 You start in Prague (unsurprising, given Vlaada is Czech and the game is published by Czech Games) and must complete the “base” scenario of nine turns and nine “acceptable mistakes”, before picking your next mission. As you move from city to city, you play the game with different Mission parameters. In Paris, for example, you have eleven turns but are allowed no “acceptable mistakes”–each wrong guess costs you TWO turns. And in Mumbai you only have six turns, but are allowed to tag five innocent bystanders. The campaign mode only increases the amazing replayability of the game, not forgetting the possibility of opening up to team play as well. I predict that Duet, arriving this week in stores, will soon join Codenames at the top of the standings and additionally become the go-to game for date nights and “games with significant others”. A review copy of Codenames Duet was provided by CGE to the DWP for this article. Why do you suggest this? ‘I’m sure he could design a pure abstract–and I’d be fascinated to see the results–but he doesn’t seem to be interested in those kind of games….’ Task Kalar comes pretty close.